Collecting the trash from Creston Street, Wednesday, April 15, 2015. A new map details the amount of litter scattered across Philadelphia, a tool that city officials say will help them make data-driven decisions in their attempt to rid streets and lots of trash. The so-called "Litter Index" rates conditions on roads, parks, schools, transit stations, infrastructure sites and vacant lots. 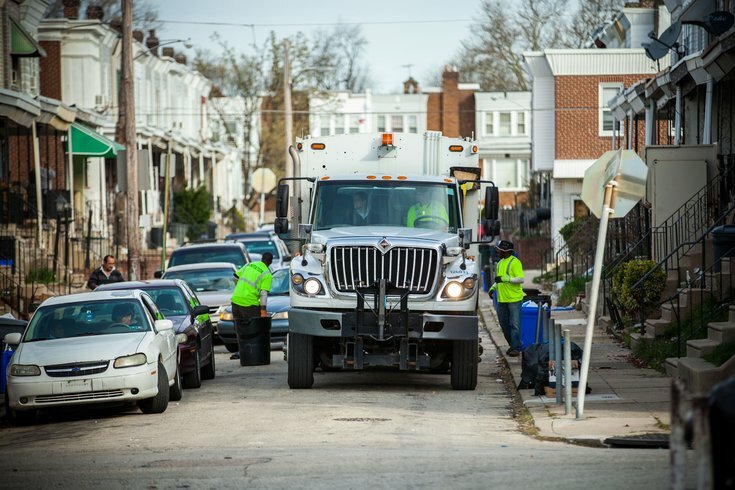 Trained staffers from six city departments spent five months last year surveying the entire city, ranking each block on a four-point scale based on metrics from Keep America Beautiful, a nonprofit that aims to diminish littering. The scale ranges from areas that contain nearly no litter to areas that would require a large cleanup effort or heavy machinery to remove heaps of trash. Most of Philadelphia falls toward the lower end of the scale, according to the map. The greenest areas have the least litter while the red areas have the most. Using the map, residents can search their addresses to find the average litter ratings for both their streets and neighborhoods. The map is part of a broader "Zero Waste and Litter Action Plan" that aims to eliminate the use of landfills and conventional incinerators by 2035. Litter surveys will continue each year, enabling city officials to track conditions and document improvements. The results will be used to make data-driven decisions on both operations and policy. But city officials also want residents to use the Litter Index as a way to assist in the clean-up. It includes links explaining how to create block captains, watershed groups and park groups. Nic Esposito, director of Philadephia's Zero Waste and Litter Cabinet, called the city's first litter count since 2007 a "great" effort. "However, many of our neighborhoods have streets and open land with trash accumulations and it's our goal to improve these areas," Esposito said in a statement. "We want the Litter Index to be the tool that connects residents to resources for cleaning and greening their neighborhoods."